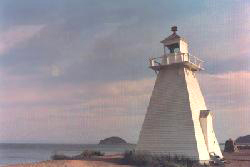 The lighthouse was built in 1904 and first lit on July 15 of that year. The project, supervised by the first keeper, Baxter McLellan, cost $645.87. The building, constructed of timber, was 33 feet high from the base to the ventilator on the lantern, with a main floor about l5 feet square and interior stairs leading up to the light. It was built on the beach, 63 feet back from the water to the eastward of the inner end of the Government pier. (Now gone.) The light was fixed red, visible for about 7 miles from all points of approach, with a seventh order dioptric lens. This photograph is of this tower, which still stands, but is now much closer to the water. It shows the old fog bell apparatus that was used many years ago. There was a winding mechanism, and once wound, the bell would ring for about 12 hours before re-winding was necessary. The first keeper, Baxter McLellan, was paid $100 per year at his appointment in 1904. The light was discontinued in the 1980's because commercial shipping no longer used the channel. It was acquired by the Spencers Island Community Association from the Federal Government after 2 years of negotiations. It opened to the public in 199I as a small museum with pictures of the sailing vessels built in local shipyards, artifacts and the like. In 1995 and 1996 major renovations were made, funded by local fund raising projects. The lighthouse with fog bell. This photo, sent to NSLPS by Margot Kerr, shows her mother as a child of six or seven, posed beside the lighthouse. The shed to the right is an indication that the lighthouse was a reasonable distance from the water at that time. Now, it is right on the beach! In I995 the light was approved as a municipal heritage structure. It is open to the public in July and August. Over the decades, the lighthouse has been loved by the community. It has received great support from residents since it was awarded to the Community Association. In 2010 a major restoration of the lighthouse was undertaken. 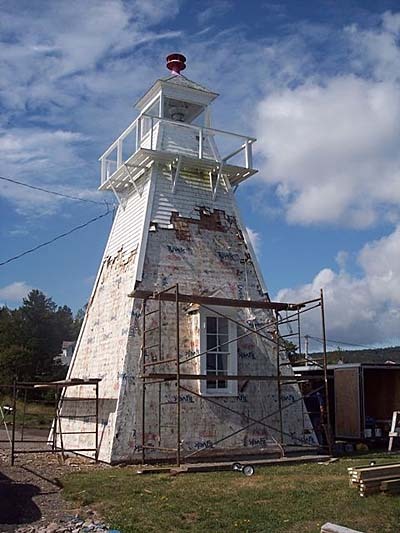 The craftsman who did the renovation is the great-grandson of the fist lighthouse keeper, Baxter McLellan! 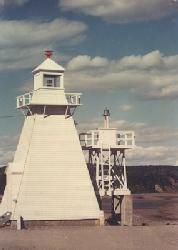 This is a small light located on the Minas Channel, the link between the Minas Basin and the Bay of Fundy. 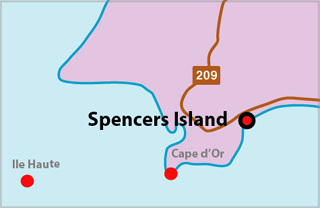 The village of Spencers Island, where the light is located, is named after the nearby island which lies in the channel. In the days of sail this was an important ship building area. Many important vessels were built here and captains of Nova Scotian deep-sea sailing ships were born here. There were two reasons for establishing a light at Spencers Island. First, in the days of sail this area behind Cape D'Or, was a popular anchorage for vessels waiting for a favourable wind to go up or down the Bay of Fundy. Second, for years after the turn of the century old square riggers were cut down and converted to barges, and used to transport gypsum from near Windsor, N. S., to New York. The barges would be towed by a small tug to Spencers Island where they would wait for an ocean-going tug to pick them up and tow them on to New York. The procedure was reversed for the return passage. 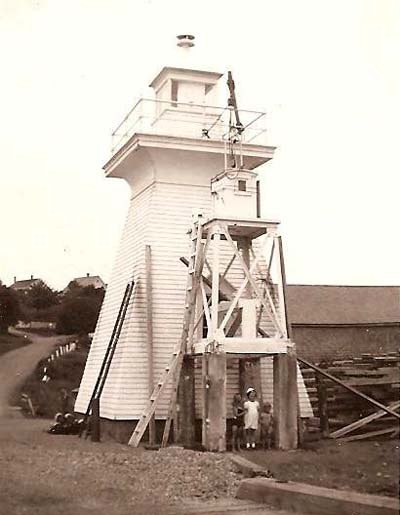 The first lightkeeper, Baxter McLellan, was a shipwright who helped build some of the square-riggers at Spencers Island and supervised the building of the lighthouse. He also sailed on square-riggers as ship's carpenter and, as such, saw much of the world. After he left the sea, he had a small building near the lighthouse where he used to make canvas chairs and stools and most of all, entertain the tourists with tales of the sea.